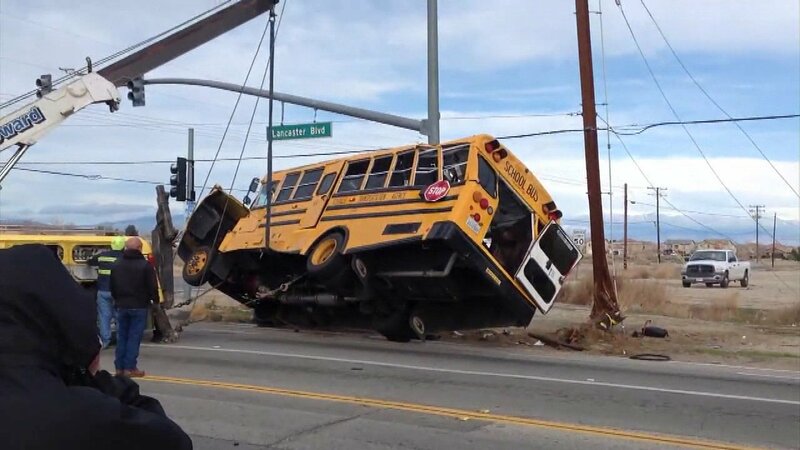 Ten students were injured - one critically - after a school bus and a vehicle crashed in Lancaster, California. LANCASTER, Calif. -- Ten students were injured - one critically - after a school bus and a vehicle crashed in Lancaster, fire officials said on Tuesday. The crash occurred near 20th Street East and East Lancaster Boulevard around 7:15 a.m. There were 10 students on the bus - nine suffered minor injuries and one was critically injured, according to the Los Angeles County Fire Department. In addition to the one critically injured student, the solo occupant of the other vehicle involved in the crash was also critically injured, officials said. A map shows the location of a crash involving a school bus and a car in Lancaster on Tuesday, Feb., 7, 2017. The school bus driver was unharmed. According to a California Highway Patrol incident log, the bus was for special education students. Five ambulances were requested. The two critically injured individuals were transported to a local hospital.